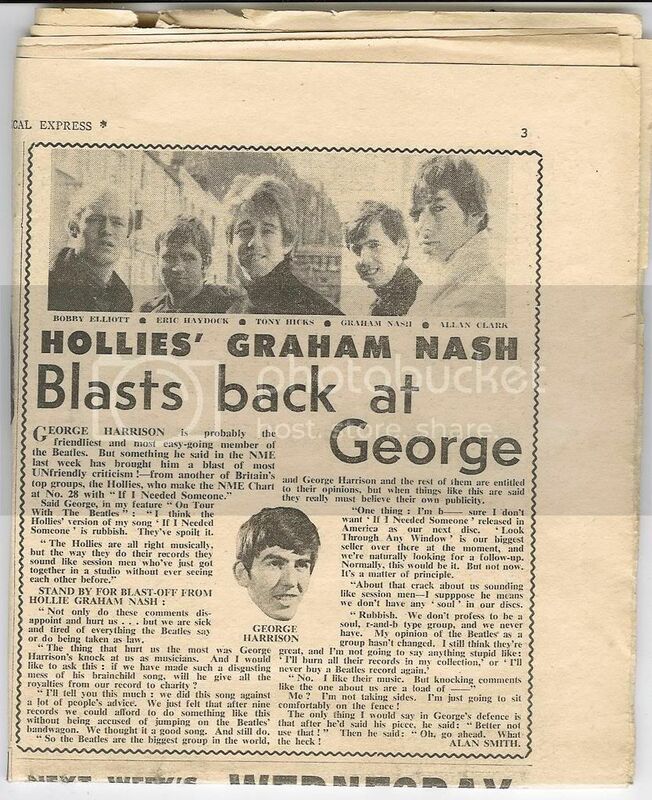 Here is the article from NME December 17, 1965. Allan looks strange in the photo, doesn't he? Thanks for that article, Agneta. This does sound strange. I think someone was trying to cause trouble and embellished the truth. Allan does look strange in the photo. Maybe they airbrushed it a little too much! I know I'm jealous of this! Patti's married to George, and hangs out with Allan! Some girls are just too lucky for their own good! And she's slim and blond . I hear you, hon. What have these blondes got that us brunettes don't have?! And just when I was starting to like you! No, just joking, Kat. I'd like you if you had turquoise hair! Oh, well. Some things never change. Elvis didn't like Cliff Richard and other ones who copied him when they started out and the BEatles hated bands who followed their footsteps. I never understood that. John Lennon also said that he hated The Hollies (it is somewhere in his biography written by Ray Coleman; can't find it now). But who did The Beatles like of their fellow Beat groups ? They only liked those which became equally successful with a different style like The Stones or The Kinks. Although John also asked Ray Davies why they didn't record any Beatles songs and he said that he writes for The Kinks and they don't need to record a Beatles number. A good answer!!! What does that mean ? NOT to record a Beatles number isn't o.k. and to record one is not o.k., too ? I wonder what The Beatles thought about other cover versions of their songs by other Beat bands, like "Ob-La-Di, Ob-La-Da" by The Marmalade or "Good Day Sunshine" by The Tremeloes. But I'm sure they didn't like those versions either. Don't get me wrong!! I love The Beatles and I'm as much a fan of their music as of the music by The Hollies but sometimes it seems, as if they had been sitting on a throne way up above the other group's heads. O.K., they set a standard but that standard was very high and every group that could be as creative as them AND successful like The Hollies has made a great job. I think that Graham's reaction was great in the article. He admitted that he loved The Beatles (I wouldn't have believed anything else) but that he doesn't like that sometimes it doesn't count what other groups do except for The Beatles. And if somebody really wants to tell me that The Hollies sound like session men on their recordings then I would give them the advice to listen to songs like "Mickey's Monkey" or "Too Much Monkey Business" where they are screaming and shouting and cheer on each other and they put all their energy into those songs. To me it sounds like professional musicians who love what they are doing and understand each other in what they are doing.